iCloud stores your data on a remote server that syncs data updates between your computers or iOS devices. Even if you only use Calendar on your iPhone, it makes sense to use iCloud so you have a remote copy of your Calendar in the unfortunate event that something happens to your iPhone. 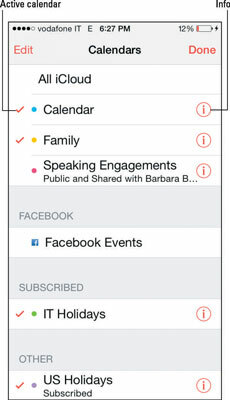 To turn on iCloud, open the Settings app, tap iCloud, and tap the Calendars switch on. Any changes you make in Calendar on your iPhone or on other devices associated with iCloud, such as your computer, iPad, or iPod touch, are automatically pushed to all devices.